Thanks to Alan Belson for sending this picture. Alan's comments below are copied from the thread which prompted this posting, and the first part refers to the modern trains used in the Channel Tunnel linking England and France. The locos run on 25kv ac single phase, one OH wire, neutral to a rail, with literally TONS (thousands) of small fan-cooled solid state triacs or diodes on board coupled to transformers. These pull up to 12,000KW. Not only will this allow three phase asynchronous motors (Eurostar) or 3 ph synchronous motors (type 92 freight) to be used, but the system copes with 50hz, 16.66hz, and DC voltages from 750-1500 and all stations in between using retractable shoes to pick up 3RD rail DC, if required, in all the various EU state railway (railroad) systems. I thought, Neat!! Then I found in an old book I have, published in 1926, a photo of a 3-coupled overhead pantograph electric loco of 270,300lb drawbar pull running on 11,000v single phase, with 3-phase motors running through a rotary phase-converter, all up weight 570 tons. It is absolutely massive, and makes Mallard look like a tea-trolley. Made by the Westinghouse Electric & Manufacturing Co. of America. At which time, of course, a poor old British fireman had to shovel over 20 tons of coal into a firebox between London and Edinborough. This is the best illustration of what electric power can do. Especially in electric railway transportation which does not exist too much in this country. But if you went to Europe or Asia, this would be the norm. As for being an industrial electrician, my colleages, fellow workers, never seen much of electric locomotives, electric light rail, ultra highspeed electric rail(that is a passenger train with speeds in excess of 150mph or even over 200mph like in France or Japan repectivly. They are just not interested in it. I have a vivid interest in it because,***REMOVED*** The sad part about it is their are no engineering schools in this country, best to my knowledge that offer courses in electric railway engineering as a specific. And as far as that old "Virginian" Loco, I have books on the Virginia Railroad. Up until the late 1950s early 1960s That loco worked the main line from Roanoake Va to Mullens West Virginia of about 134miles under the catenary overhead wire power of 11,000volts @ 25 hz . The lower the frequency the better for power, that is on some locos you can fit a smaller motor at 25hz than at 60hz the same HP. On a locomotive or multiple unit type train you had limited space to contend with. Also a competing railroad that almost ran along side of it, the Norfolk & Western had similar system except only about 50 miles, because the steam locomotives could not handle the tunnels and steep grades. The electrics where the best and the most efficient even in comparison to todays modern diesel locomotives. On a safety note I have read about some shop people working on those old electric locos in which a few shop personel got electricuted. One of those companies Virginian or Norfolk & Western ? had a policy of LOTTO lock down and ground out the Pantograph, which is the sissor like contraption on the roof to collect power. The company that did not have the lock out policy of that pantograph had a few deaths of shop personel. This is probably the origins of tag out lock out. As for the history of electric railways, its origins was the forefront of todays modern industrial pilot controls to all kind of automations and power distributions. Industrial pilot control was contibuted by inventor Frank Julian Sprague,circa 1888 when he was perfecting the speed control of Direct current motors for electric streetcars in the city of Richmond Virgina. Mr. Sprague was Thomas Edison's right had man. On a final note on the matter of electric railway rolling stock, our National Electric Code up until the late 1920s early 1930s did cover on board car wiring especially with passenger street cars. Yes, some of them had conduit runs with NEC compliance installation at the time circa 1927 according to an old electric railway engineering book I have! Except this book does not have all the power electronics of todays modern electric locomotives. Here in England, electric traction has made something of a comeback in new Metro "tram" (street car) systems. It's rather ironic when you consider that the original tram systems in many of the larger cities were torn out decades ago. I'm particularly fascinated by the old systems, and we're fortunate in having a few which have been preserved here, such as the Volk's Railway in Brighton, the Seaton tramway in Devon, and the famous Blackpool trams. On regular trains, the routes from London down to the south coast (commuter country) are 3rd-rail electric, while several of the longer-distance mainlines running northward have been electrified (25kV overhead) over the years. And of course, electric traction has been used on the London Underground (subway system) for over a century. Some years ago London Transport, who run the Underground system, were approached by a team of VPs from a Metro Corporation, I think from Japan, anxious to sell a retro-fit multi-million £ regenerative-braking system to the Underground trains. They were politely informed that the Underground had fitted regenerative braking from inception, 100 years earlier. The system had never cost one penny in maintenance charges or capital repayments for a century, it had cost practically nothing to build and it was nearly 100% efficient. The designers had simply built all the stations 10 feet higher than the rest of the track! Trains coast uphill to stop, and get a downhill boost as they leave. Don't Work Hard, Work Smart! I live in Portland Oregon USA, and ride this train daily to work. Its really cool, fast, quiet and efficient. Plus its only 1.35 for a ticket. Not a bad deal for 70 someodd miles of track. 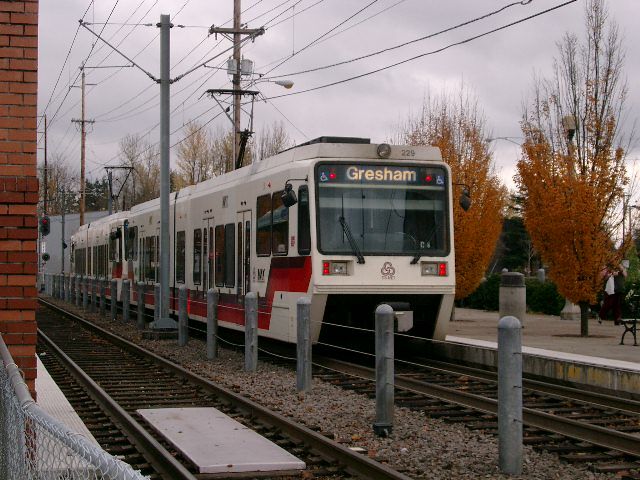 Max/trimet is a fine transport system, serving Portland well, reducing pollution, attracting investment and creating 2600 jobs, among other attributes. It isn't economically viable in the 'business' sense & never was intended to be- it's a Public Service, Public Funded- a niche market. Your $1.35 ticket only covers 20% of the actual operating cost, taxpayers pick up the rest; fine in context to its stated aims. The Channel Tunnel (the American Society of Civil Engineers called it "One of the Seven Wonders of the Modern World") is funded soley by ticket sales. Went on the web earlier, (it's night here now), - quote was US$480 return, car+2 passengers tomorrow- & that'll be $800 by mid-summer- for a 33 mile return trip. Yet just today the Tunnels' debt, a staggering US$11,800 million is being "re-structured"- ie the shareholders' just lost their shirts. All this, with 30 million (total all routes)passenger crossings per year- that's 25% of the total populations of France and the UK combined, so no lack of business. As I said in my previous post- transport is never profitable for long. Don't forget the big GG1's used on the Pennsylvania railroad passenger services. These electric loco's served for about 50 years ( 2 CO CO 2 ). 11 kV 25 Hz. The Milwauky railway had also some interesting electric loco's with a very high tractive bipolar motor design, i read about, cant find the book at the moment. The lower the frequency the better for power, that is on some locos you can fit a smaller motor at 25hz than at 60hz the same HP. On a locomotive or multiple unit type train you had limited space to contend with. Paula, I think that you got the frequency data wrong. The lower frequencies like 16 2/3 and 25 Hz were used in the earlier AC traction days when sparking at the commutators was a big problem in the motor design. Now 50 or 60 Hz is not a problem anymore because designs have improved and even 3 phase is available via special converters built into the locomotives , which take 1Ø from the grid and via thyristors and dc bus can be converted to 3Ø for brushless asynchronous traction motors. In the airforce 400 Hz is used, In general the higher the frequency the more compact the motors and transformers hence less weight. Dm3 1-D+D+D-1 used on the iron ore line. 15000 Volts 16 2/3 Herz with Jack rods on the big traction wheels. I see if I can scan some piccies in from these loco's. I'm an electric and diesel loco fan too. Commercial aircraft too. That incessant high-pitched whine that continues even after they shut off the engines is 400Hz transformer hum. 25Hz was not used only in rail service. Early industrial systems used 25 Hz because many applications called for a slower RPM motor. There is a fascinating story about how 25Hz came to be a standard in the US. Early Westinghouse (pre-Tesla) equipment was 133Hz single-phase. Tesla's designs were all 60Hz and so superior that Westinghouse abandoned previous designs. Industrial power called for low frequencies due to the demand for low motor speeds, but these frequencies were not suitable for incandescent lighting because they caused lamps to flicker. Tesla proposed 60Hz for lighting and 30Hz for power, but during the design stage of the Niagara Falls power project, there was a lack of communication between the mechanical and electrical engineers. It seems the turbines had already been ordered, with a design RPM not suitable for 30Hz. The power system was changed to 25Hz, and since Niagara was such a large project, 25Hz became the standard. It would really make much more sense to have 30&60, or 25&50, since two alternators with different numbers of poles could then be driven by the same shaft. 25Hz power systems become more scarce by the year. I didn't know that Alan (Alan Belson) was a fellow Railfan! Cool!!! Like the "Engineer" references, too! Hats off to the other Railfans in this thread!